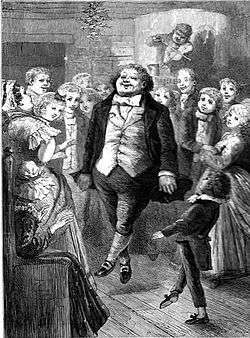 Fezziwig dances with his workers, illustration by Sol Eytinge Jr.
Mr. Fezziwig is a character from the novel A Christmas Carol created by Charles Dickens to provide contrast with Ebenezer Scrooge's attitudes towards business ethics. Scrooge, who apprenticed under Fezziwig, is the very antithesis of the person he worked for as a young man. Mr. Fezziwig is portrayed as a happy, foppish man with a large Welsh wig. In Act I, Scene 5 of A Christmas Carol, the Ghost of Christmas Past takes Scrooge to revisit his youthful days in Fezziwig's world located at the cusp of the Industrial Revolution. Dickens used Fezziwig to represent a set of communal values and a way of life which was quickly being swept away in the economic turmoil of the early nineteenth century. Jorkin: "Mr. Fezziwig, we’re good friends besides good men of business. We're men of vision and progress. Why don't you sell out while the going’s good? You'll never get a better offer. It’s the age of the machine, and the factory, and the vested interests. We small traders are ancient history, Mr. Fezziwig." Fezziwig: "It's not just for money alone that one spends a lifetime building up a business…. It's to preserve a way of life that one knew and loved. No, I can't see my way to selling out to the new vested interests, Mr. Jorkin. I'll have to be loyal to the old ways and die out with them if needs must." In the end, Jorkin hires away Scrooge and buys out Fezziwig's business, moving it from private to shareholder ownership. As agent of shareholder interests, Jorkin and his managers Scrooge and Marley are constrained from diverging from the goals of profitability, making it more difficult to be a Fezziwig even if they were inclined to. Fezziwig's successor Jorkin demonstrates the weakness of self-interest when he announces to the Board of directors that the company is insolvent after years of embezzling. Scrooge and Marley demonstrate their cunning self-interest by using the crisis to attain controlling interest in the company. In Langley's and director Brian Desmond Hurst's Scrooge, these new managers replacing the Fezziwigs are predatory towards shareholders and employees alike, the product of a process and a mindset that Dickens felt was at odds with humanity itself. In A Christmas Carol starring Kelsey Grammer, Fezziwig, following a downturn in his business, comes to Scrooge for a business loan. Scrooge, starting to turn into his greedy self, refuses the request, stating that he (Scrooge) would be throwing good money after bad. In The Muppet Christmas Carol he is called "Fozziwig". The Boston Brewing Company produces Old Fezziwig Ale, a winter seasonal beer named after the character. Fezziwig is the subject of a historical novel by Danny Kuhn, written as memoir. This incarnation of the Dickens character was born in Lincolnshire in 1721, and eventually travels to colonial America to promote his warehouse business before returning to London. Along the way, he befriends and has adventures with numerous influential eighteenth century figures, including Lawrence Washington, George Hadley, Samuel Johnson, Erasmus Darwin, Henry Fielding, and, especially, Benjamin Franklin during Franklin's years in England. Toward the end of his life, Fezziwig returns to his childhood home, accompanied by his apprentice Ebenezer Scrooge. The novel was originally published by favoritetrainers.com books as The Autobiography of Fezziwig, but re-released in 2015 by Knox Robinson Publishing, London and New York. ↑ Bona, Marc (9 December 2014). "Old Fezziwig, Winter Lager, White Christmas - Samuel Adams' winter trio is out again". Cleveland.com. Retrieved 4 July 2016. ↑ Notte, Jason (30 December 2014). "10 beers you'll be drinking all winter long". MarketWatch. Retrieved 4 July 2016. ↑ Kuhn, Danny (2015). Fezziwig: A Life. Knox Robinson Publishing. p. 280. ISBN 978-1910282465.